It took far too long to get it done but the portable AC is working great. Got the fan blade glue back together everything lined up right everything tight the way it's supposed to be INRI assembled and tested it doesn't cool down as fast as I would like but it never did. Very happy that I don't have to scrap this piece of equipment at least yet. If I had it to do all over again there is no way I would do a portable unit. I would either boxing and duct a window unit or budget would permit I would use a ductless split system. 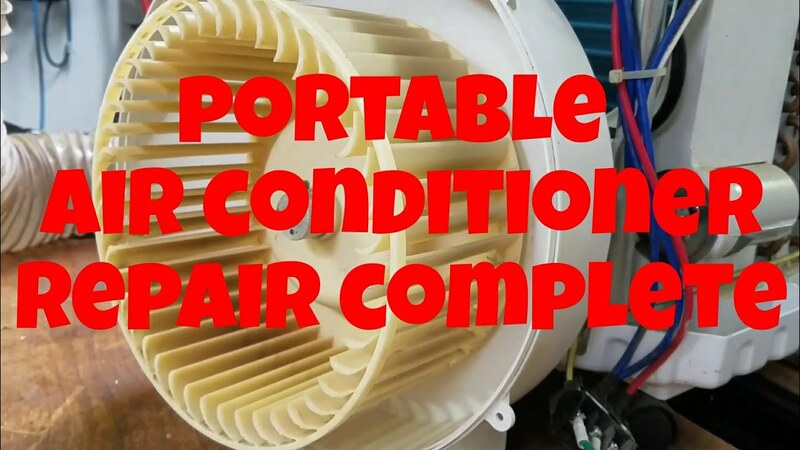 Royal Sovereign ARP 1400 ww portable air conditioner broken fan fixed. Home garage Workshop air conditioning working great. Okay folks, here is the report for the day. Temps were into the lower 80s in the Clear Lake area yesterday, and rain, rain all day, so it was HUMID. I got home from work, the shop wall thermometer read 85 deg F, no clue what the RH was, but it was nasty sticky. I kicked the A.C. on at 5:45 P.M. and took the wife to the grocery store as we ran out of potatoes and bacon for a recipe we were going to work on (Bratkartoffeln mit Kraut). I left he AC on and ran out for about an hour and a half. I set the T-stat for 65 just wanting to see what the unit would do. When we came back, I realized the air by the unit was cold, the air by the bench, and miter saw bench was still stifling, so I turned on the air mover fan hung in front and above the AC from the ladder. (Odd rig, but it works). Went back into the house to work on dinner, came back out 20 minutes later. So 1 hour and 55 minutes after starting the unit up, the garage was COLD. The thermostat had shut the compressor off and I was simply running on fan at that point. the wall thermostat read 67 deg F on the other side of the shop from the AC unit. Assuming I remember to turn on the air mover fan at the same time, I expect, of course assuming this dumb thing doesn't try to grenade itself again at some point this summer, but I expect this to be sufficient for my shop through the summer, and given any luck in the matter, it should last a few more years, but I need to start planning, and budgeting. I've never given up on the concept of a dedicated small shop out in the back yard. Budget and family issues stepped in the way over the years though. I do have a savings account building up for a, well, building. I think without the lawn and garden, auto repair tools, and deep freeze, plus with loft storage for lumber, I could not only easily fit everything in, but be comfortable in a 12x24 gambrel roof barn. However to get a building that size approved by my HOA, I actually have to have it physically attached to the main structure of the house. After talking with my wife about it, a covered breezeway seems the best option, and one she likes. I would have to get Verison and Comcast to move their lines (at my expense I know) out of the middle of my property to the actual easement / utility run by the fence line, and much of the remaining back yard would be taken up by pavers and planters to provide usable recreational space. (Smallish lot for Texas anyway). That would make my wife happy, but happier still would be to get the stuff we have now paid off, and fixed... So on to more projects! Hooray for airconditioning, esp. in Texas! Getting a temp drop from 85 to 67 in a humid condition is great......especially with a portable unit. I believe you can mark this off your to do list. When the inside temp becomes uncomfortable I turn the AC on and leave it on until the outside temp drops below 72. In SW Ga that is from March to November, then mi turn it to heat and let it cycle like it wants to. I picked up a used 13KBTU portable unit at the very end of last seasons after getting tired of sweat dripping all over the dressers I was building most of last summer. I don't have any windows in the garage, so I'm not sure how I'm going to duct it yet (it's a 2-hose system). I'm also reluctant to cut holes in the wall until I find out if this thing actually can cool the space down a bit. Your data is encouraging though. I have no actual data on portable ACs, but a fair amount of experience with their use. On the local Marine base where I worked, the public works dept probably had 100 of them. When air conditioning failed in office or residential areas and their techs couldn't get the AC operational quickly they would roll in a portable and plug it in and would run a duct hose out the window when possible. If no window was available or they couldn't use a window for security reasons they would remove a ceiling tile and duct to the over the ceiling area. This was counter productive as it heated the whole area up. Condensate was always a problem, there was seldom anywhere to run the drain hose and nobody wanted to empty the tanks. Another inherit problem with portable units was the heat generated by the compressor, fan motor and coils to frame heat. This additional noise and heat into a room with poor air conditioning was unwelcome, and if the technician couldn't get it going quickly they called me in to determine if the building AC was repairable and get qualified contractors working on the unit, or design a new replacement system and get It expedited. For a portable unit in the shop this unit should cool 700 sf. I wouldn't hesitate cutting a hole in the wall for the duct, after you determine the unit works. Place the unit close to the wall penetration and build a box around the AC and run the condensate drain outdoors. Just like dust collection, keep the flex hose as short as possible. You wouldn't believe the difference it makes going from 2 feet of 4 inch duct to 10 feet of flex, it cuts the airflow probably 50%! You might even remove the flex and install metal duct or pvc pipe. From personal experience I can say that turning the AC on, setting the thermostat and leaving it on is more economical than turning it on when you want it cool and being disappointed because it is still hot inside. After the AC gets the room temp under control it does not have to cycle on very often. In the 6+ years my shop AC has been in service I have not seen any noticable increase in the utility bill, and last months utility bill is the same as it was in 2014. Believe me, if there was a rise utility bill my wife would not let me forget it. During the hot SW Ga summer months AC is an absolute must. Nothing is more miserable than to try to do woodwork in a 100 degree shop, fanning gnats, sweat running off you like a faucet and sawdust sticking to your wet skin! ..... Oh Oh, I almost forgot to mention, I'm not comfortable leaving the doors open because a snake might crawl in. Too many benches and cabinets for them to hide under. Nothing is more miserable than to try to do woodwork in a 100 degree shop. I need to get insulated garage doors then A/C. Already insulated walls and ceilings. I was thinking a split air system. It seems that would be the most economical to use but more up front than a portable or cut a hole in wall for window unit. If you have aluminum garage doors, insulating them is super easy. I did a sandwich of R-Max and faced teh feflective sides out both ways. Attached the panels using Liquid Nails for projects, and filled the gaps with touch N Foam..
All told, I have the insualtion, electrical parts, most of the framing, hinges, fasteners,hinges, locks, tar paper, and shingles. Looks like I mostly need about 4 cu /yds of soil to level up and compact, about 3 cu /yds gravel to top that with / drainage, sheet goods for sheathing, flooring, and decking. Again Habitat ReStore gets that stuff in from time to time. And of course siding and paint. The digital control panel on the front doesn't work any more, not sure why but it works via the remote. My electric smoker is like that. The RF remote interfaces directly to the control board, but the button panel has its own interface separately. That went bad (or the buttons themselves). So I can't see anything on the display, nor use the local buttons, but the remote buttons and display are fine. Of the two, I'd rather keep the remote working! My wife’s first cousin purchased a portable ac unit (from SAMS I think) for their daughter to use in their rental house while the main ac was out of service. They asked me to look at at for them because it wasn’t cooling the room to suit them. My first impression when I got there was that within several feet around the unit the temperature was noticeably warmer. The unit does not appear to have the heat from the compressor or fan motor ducted outside along with the air from the condenser coil. This is like having a large toaster oven running in a room that you are trying to cool. To properly cool a portable AC should have 2 ducts running to the outside, one pulling in outside air to blow through the condenser housing which cools the condenser coil, compressor and fan motors and the other duct carries this heated air outside. I bought a portable A/C unit for my 12 x 20 work shed a few years ago, that first summer. While I had heard good things about them, I just didn't find my purchase to be all that efficient. Of course the fact that the shed was un-insulated and a dark green in color didn't help the situation at all. Starting on a late cool morning, even with the setting at maximum, the 30,000 btu unit couldn't hold the temperature, which continued to rise almost as fast as if it wasn't there. Just too much heat escaping around the duct hose and cabinet. Nice idea, and perhaps with better insulation it might have done the job, but I doubt it. I think a window or wall unit would have worked better, and perhaps a mini-split would be best of all. But for something like a shed, where I get absolute minimal time, that wouldn't be worth the investment to me.... not at this time anyway. Secondly, I know of no 30K BTU portable units, at least not consumer grade units. There are industrial spot coolers that rely on jamming the heat up through a drop ceiling and into a plenum, the are frequently used in data centers for emergency cooling when the main unit goes on the fritz... I seriously doubt that is what you are using at home in that small of a space... So I gotta know. What make and model is your portable unit?